Los Cabos Golf Resort in Cabo San Lucas, Mexico! Buy a 7 Night Stay in a Studio or 1Bedroom Suite ! at Los Cabos Golf Resort in Cabo San Lucas, Mexico! Relax and renew within our lush oasis in Cabo San Lucas. With its unique blend of affordable luxury and sun drenched serenity, Los Cabos Golf Resort is an oasis like Resort renowned for its world class service, restaurant, and 18-hole Dye Designed golf course. 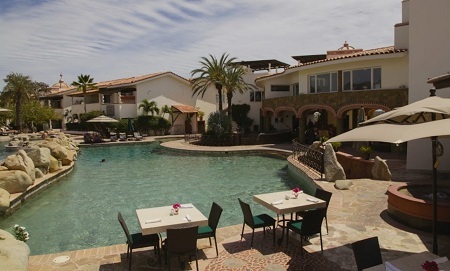 Located just minutes away from downtown Cabo San Lucas, the sprawling boutique resort and vacation ownership property allows guests to enjoy the town’s bustling restaurant and nightlife scene while still providing a tranquil and much needed retreat. 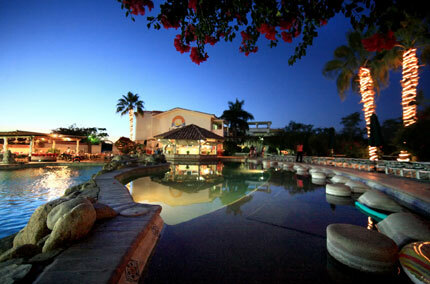 Los Cabos Golf Resort, an Interval International Select Resort, is the area’s premier relaxation destination. The Resort’s bi-level pool with connecting slide and swim-up bar, the downstairs grotto-like pool, stone hot tub, and plenty of poolside seating entice guests to languorous days under the sun. For guests who want to take relaxation to the next level they can indulge in facials and any of a variety of massages, including Swedish, deep tissue, and reflexology at the Resort’s mini spa or in the privacy of their own villa. Those looking for more action can hit the links at the adjacent Cabo San Lucas Country Club, which features a pro shop, driving range and dazzling fairway views of the ocean and Land’s End. Double Eagle Restaurant and Bar, the resort’s patio restaurant, with its above-par authentic, traditional Mexican dishes and service has built a reputation of their own, regularly attracting residents and tourists not even staying at the Resort. Whether you’re seeking to escape a hectic work schedule, sharpen your golf skills, soak up the sun, or peacefully travel with the family, it’s time to book your next trip to Los Cabos Golf Resort. Your Studio Unit will sleep up to 2 guests with a partial kitchen. Your 1 Bedroom Unit will sleep up to 4 guests with a partial or full kitchen.